8 Commercial Real Estate & Properties in Buddina are listed in 2 categories. We have 5 OfficesSale & Lease and 3 Retail ShopsSale & Lease . Ground Level Office/retail In Buddina $29,000+GST inclusive of .. It's rare a premise that ticks so many boxes hits the market. Main road exposure A Grade fit out Entire top floor position Stunning water views 15 car spaces plus 3 car garage Perfectly positioned between the coast's two largest growing regions, and adjacent to the newly expanded Kawana Shopping World. Also available for Sale at $2,600,000 Please contact the leasing agents Jordan Hayes on 0417 999 331 or Michael Shadforth on 0488 981 076 for further information. It's rare a premise that ticks so many boxes hits the market. Main road exposure A Grade fit out Entire top floor position Stunning water views 15 car spaces plus 3 car garage Perfectly positioned between the coast's two largest growing regions, and adjacent to the newly expanded Kawana Shopping World, this unit presents an amazing opportunity for investors or owner occupiers alike, with the current lease expiring 30/06/2019. Also available to Lease for $185,000 p.a + Outgoings + GST Please contact the selling agents Jordan Hayes on 0417 999 331 or Michael Shadforth on 0488 981 076 for further information. 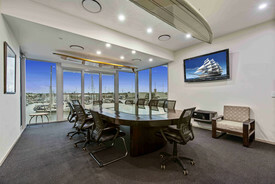 Sunshine Coast's Premium Waterfront Office $190,000pa + Outgoings + ..
Professional Offices For Lease | Kawana Waters From $795 Per Month incl ..
Office space from $183 per week including all outgoings and electricity (incl GST) Various sizes of office available from a single room to 40m2 Free Wifi accessible High quality fit out, fully partitioned and air conditioned Recently renovated with fresh carpet and paint Surrounded by existing tenants such as Kawana Dental, Coast Chiropractic Kawana, Coastal Family Health, Mortgage Choice, and many professional consultants. Kawana Professional Offices are situated on Point Cartwright Drive in Kawana Waters. The property fronts the Kawana Shopping world precinct with access to a number of public car parks with staff and client car parking onsite. Each office has a phone and internet connection with access to the free Wifi service. Small office premises are under high demand so you don't want to miss out on an opportunity to view these fantastic little offices! Contact marketing agent Emily Pendleton for further information and/or a quick no fuss viewing.